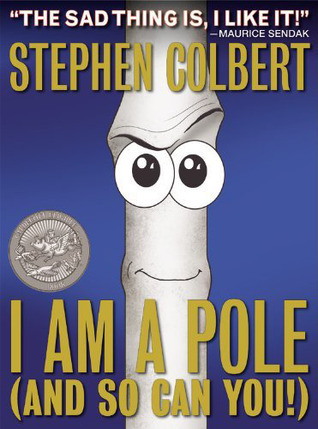 Another fun audiobook I picked up for my long drive a couple weekends ago was Stephen Colbert’s I Am A Pole (And So Can You!). As a child, of course, I loved Maurice Sendak’s books, and his interview with Stephen Colbert on The Colbert Report earlier this year was one of the funniest segments I had seen in a long time, where Sendak inadvertently inspired Colbert to write a children’s book. I Am A Pole (And So Can You!) is the result. (Click to watch Part 1 and Part 2 of the interview.) I was excited to see Colbert’s mock children’s book available in the iTunes store right before my trip. I didn’t have very high expectations—I knew it would be really short (8 minutes) and simplistic. But I did find it amusing in a cute and silly sort of way. Nothing earth-shattering as far as comedy goes, but some of the lines are very clever and unexpected—great wordplay. Tom Hanks is delightful in his narration, and the exchanges between him and Colbert (Colbert was “supervising” the recording and gave the introduction) are perhaps the best parts. I think I Am A Pole would probably work best as an animated cartoon—the audio really enhances the experience of this one, but without the illustrations a bit of the fun is definitely missing. All in all, I Am A Pole is a fun little book worth hearing once at least, and I like that Hanks and Colbert are donating profits from their involvement to U.S. Veterans Inc., which gives support to homeless veterans with housing, job training, and counseling services. That definitely gets a tip of the hat from me! Listened to audiobook on July 13, 2012. This entry was posted in books and tagged audiobook, fiction, humor by kristin @ my little heart melodies. Bookmark the permalink.